Cheesy Chicken Alfredo – Chef Tom Cooks ! Beat eggs with milk in a bowl. Add 1/2 cup grated cheese and parsley. Set up another bowl with some bread crumbs. Dip chicken pieces in egg mixture and roll in bread crumbs. Lightly brown on both sides in a skillet with a bit of olive oil. Remove to a baking dish. Over medium heat, melt butter. Add cream and milk, stirring constantly. Add cheese and parsley until the sauce warms up. Pour sauce over chicken breasts. Cover with foil and bake at 350° F for 20 to 30 minutes or until chicken is cooked through. 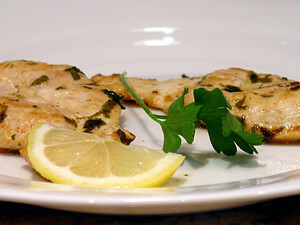 During the last five minutes, add a slice of mozzarella to each piece of chicken and allow to melt. Serve with your favorite pasta. Put the chicken on bread and you will have an amazing sandwich!